My mom kept telling me, "No, you have to wait until you're 18," every time I asked her if I could stop getting perms. Of course, being that I was in high school and my mom paid for my hair, I had no choice but to listen. For the last two years of high school, I would keep my hair straightened or wear protective styles, slowly but surely straying away from relaxers/perms. My mom kept telling me 'No, you have to wait until you're 18,' every time I asked her if I could stop getting perms. Creamy crack had been a part of my life since I was seven or eight years old, and I was ready to give that life up. I wasn't at all satisfied. 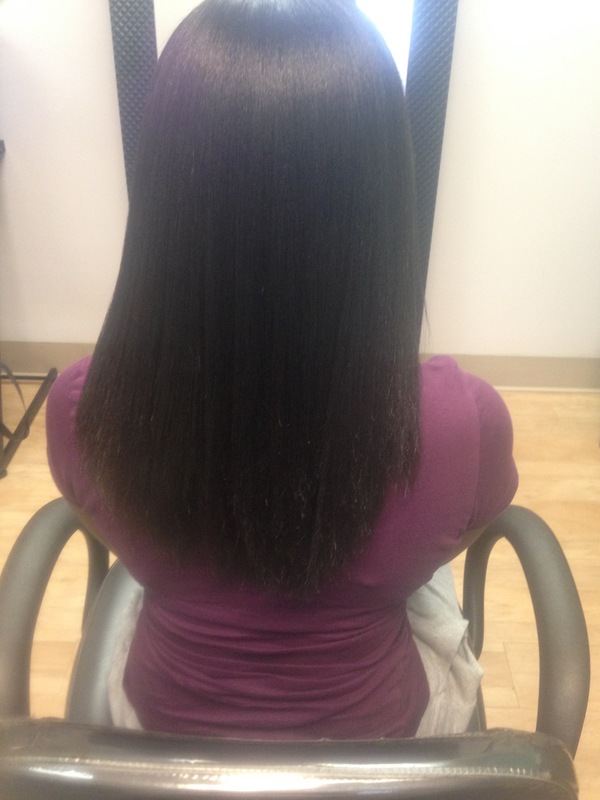 Every time I got a perm/relaxer, my hair burned to no end and scabbed. I didn't experience any growth, rather my hair stayed at one length my entire high school career. But I knew all those strong chemicals couldn't be good for my tresses. Once I went away to college, I still tried to keep my hair straightened. However, I go to school in a predominantly white town where black hair care shops are few (and I didn't find any hair care shops until it was too late.) So, I began researching how to be fully natural. Instead of doing the big chop, I transitioned. As a freshman in college, I wasn't confident enough in myself to get rid of all my hair. The possible judgement would be too much to handle, and what if I didn't like it? I got my ends clipped every four to six weeks and began deep conditioning my hair with natural hair products once a week. It didn't take long for my curl pattern to appear and honestly, I loved it. My hair was bouncy, moisturized and easily manageable. Since I still didn't know much about natural hair care, I relied on protective styling for the remainder of my freshman year. By my sophomore year, I was full-on natural, rocking my afro, twist outs or braid outs whenever I could. I didn't experiment with many different products and still relied on protective styling in the colder months. But my afro became an annoyance. I attend a predominantly white institution (PWI) and my white peers were amazed. They always wanted to touch my hair and asked too many questions for my liking. I'm sure that, being one of the only black people in my classes, my hair was blocking other student's vision of the screen. My hair was finally associated with my blackness on campus and I wasn't quite sure how to navigate my identity. My white peers were amazed. They always wanted to touch my hair and asked too many questions for my liking. But it didn't stop there. I also had friends and family who didn't seem to appreciate my decision to embrace my natural hair. My grandmother (still) associates my "nappy" hair with the days when she grew up. She says it isn't pretty in an afro, and I should do something else with it. Old friends said that I needed to do something with the curly mess on my head, or that I needed to brush it. In other words, although we are all black, European standards are their definition of beautiful. I brushed these comments off (and still do) because at the end of the day, it is my hair and I rather embrace my blackness than push it to the side. On the other hand, I know that once I begin my career search, my natural hair will be frowned upon. But then again, why would I want to work for an employer who can't appreciate my race and all it has to offer? Why would I want to work for an employer who can't appreciate my race and all it has to offer? Today, I am still learning how to deal with my natural hair. My hair has grown to the middle of my back and has also become a pain to take care of. It is thick, easily tangled and just way too long. But my hair is also a blessing. There's nothing more beautiful than the curls atop my head. Going natural has helped me to further identify with myself as a black woman, as well as relate to other black women who are going through the same journey. My natural hair journey has also taught me patience. Every time I do my hair I get frustrated and joke that I'm going to cut it all off, but instead I find a solution to best deal with the length and thickness of my hair. Most importantly, this journey has taught me that everyone has a different definition of beauty. However, throughout my journey I've learned my own definition of beauty: confidence. 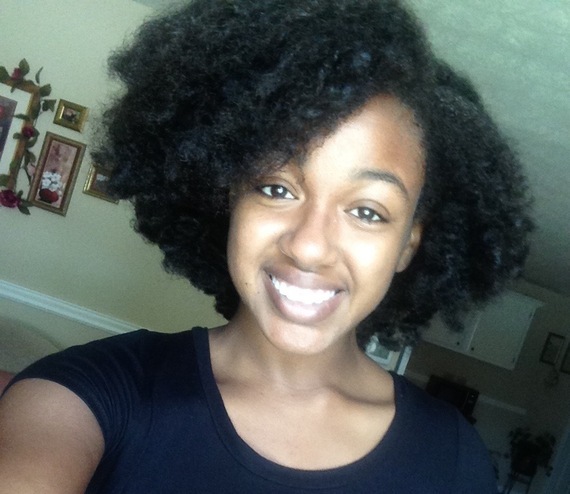 This post is part of HuffPost's My Natural Hair Journey blog series. Embracing one's natural hair -- especially after years of heavily styling it -- can be a truly liberating and exciting experience. It's more than just a "trend." It's a way of life. If you have a story you'd like to share, please email us at MyNaturalHairJourney@huffingtonpost.com.